The February 2017 Tea Box Express contained a mate, and herbal tea, and fun Valentine's themed goodies. 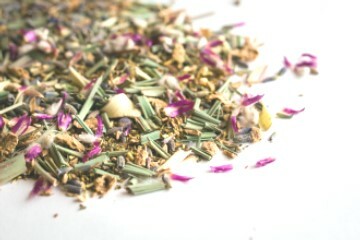 This unique and beautiful selection from Metolius Tea is a mate all jazzed up with rose petals, cinnamon, pink peppercorn, and cardamom to create a sweet and earthy blend. The other Metolius tea in the box is an herbal blend that balances many flavors with it's ingredients: pear, lavender, lemongrass, ginger, and Madagascar vanilla bean. Truly a delightful drink! Yowza! These truffles from Moonstruck Chocolate are filled with ganache infused with a touch of chili pepper for a sweet treat that packs a little kick. The Earl Grey lip balm by Beautea Studio contains organic ingredients that will leave your lips soft and protected from the elements. Two beautifully designed cards from Tea Thoughts that are cute, clever, and tea-themed.